Tom Raudonikis is one of the true iconic legends and characters not only of Rugby League but also of Australian sport. The 1972 Rothmans Gold Medal winner, a player of over 240 Senior games, 29 Test Caps for Australia (two as Captain), in 2007 voted one of the 12 Toughest Men of Rugby League in the past 50 years. Tommy is a born entertainer, and was awarded an OAM in 1982. _Tommy’s nemesis and fighting partner not only on the field but in the boxing ring! Remember that battle? Wait until you hear the boys tell that story together! Ollie was one of the great half backs from the 70s, a Kangaroos representative, and played half back for QLD in the very first Origin of 1980. 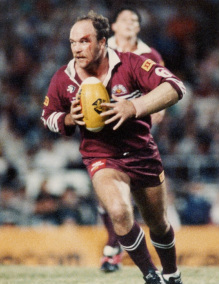 _An extremely passionate Queenslander and one who never takes a step back when it comes to arguing with Tommy over which state is the better and how good 1980 was for all those above the NSW boarder…Man of the match in the historical 1980 Birth of Origin, he also took the honours again in the second game. One of very few to win the award at Origin level more than once. _He’s The King….no point in writing what everyone already knows! If available, Wally is happy to settle the score with Tommy and impart his wisdom to all and sundry. An absolute honour for any audience we’re sure you will agree. Thanks Wally!